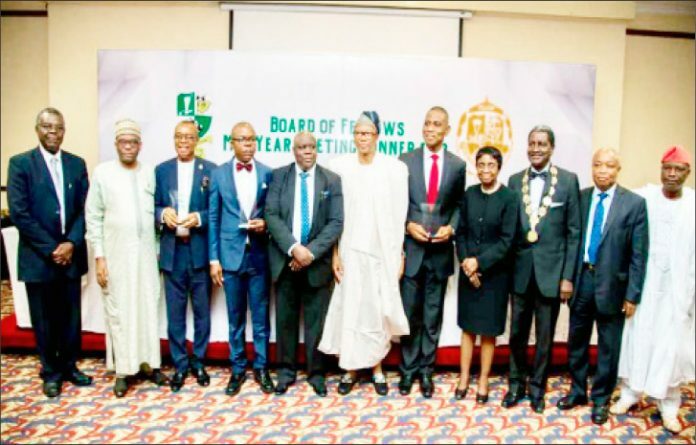 Ahmed Yakasai, President, Pharmaceutical Society of Nigeria (PSN) (middle); Prof Christiana Adeyeye, Director General, National Agency for Food and Drug Administration and Control (NAFDAC) (fourth right), Chiedu Mordi, Chairman, PSN Board of Fellows (BoF) and others during the 2018 yearly meeting and award ceremony of the pharmacists in Lagos, recently. Lagos – Amid calls to urgently tackle growing rate of drug abuse, pharmacists under the aegis of Board of Fellows (BoF) of the Pharmaceutical Society of Nigeria (PSN), recently rolled a five-year campaign against scourge to curtail its adverse effect. The pharmacists who were worried at the increasing incidence of the menace noted that over 90 per cent of drugs circulating in the country are dispensed by non-pharmacists and that there is no legislation that protects the practice in the country. Speaking for PSN, was Chiedu Mordi, Chairman, BoF, who made the announcement during the 2018 yearly meeting and award ceremony of the pharmacists in Lagos, decried the ugly consequence of drug abuse. Mordi, lamented, “The ravaging effects of drug abuse are palpable in every nook and cranny of Nigeria. It has assumed an epidemic dimension. As a result of the threat posed by the scourge, the BoF has unfolded a holistic approach of its plans for combating this problem. The strategy will comprise short, medium and long-term solutions. The project is quite ambitious, but it is do-able, the BoF PSN boss noted. Earlier at a press briefing to herald BoF conference at PSN headquarters, Lagos, Mordi, noted that emergency ban of codeine and tramadol would not solve the problem. However, he recommended that better regulatory efforts should be put in place to make sure that these drugs do not get to the people that use them. He said, “The drugs are available to so many people who are not supposed take custody of them. The problem is the easy availability of these drugs, which are usually prescription medicines. 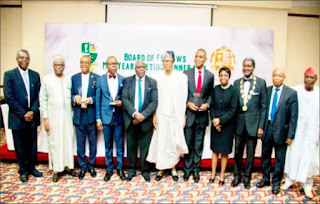 Both the press briefing and the dinner were well attended by the pharmacists, including the past chairmen of the BoF (PSN), members of the National Executive Committee (NEC) of the BoF and the chairman of the mid-year meeting organising committee members. They noted that a bill that could address the menace had scaled through the National Assembly and is now awaiting presidential assent. The group said the bill, when signed into law, would ensure that the regulatory arm of the PSN, the Pharmacist’s Council of Nigeria (PCN), is properly armed to do its work. “We have a situation where the PCN does not have any power backing it,” they said. Prof Christiana Adeyeye, Director General, National Agency for Food and Drug Administration and Control (NAFDAC) who spoke at the dinner, said the agency had engaged young pharmacists’ group to lead a nationwide campaign against drug abuse. She charged the citizens to play an individual role in terms of nation building. Recall that PSN had recently called on the Federal Government not to renege on its commitment to implement the National Drug Distribution Guidelines (NDDG) slated for January 2019 as part of measures to check drug abuse. Being in the vanguard of championing the battle against drug abuse, especially the abuse of codeine substance PSN made the call in response to the recent BBC Africa Eye documentary on codeine abuse. Yakasai, who spoke for the society however noted that the implementation of the guideline will result into better regulation of drug distribution and improve the ability of regulators to audit the trail of drugs.